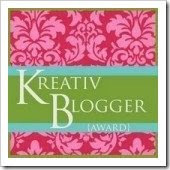 I AM SO THRILLED TO HAVE RECEIVED THIS KREATIV BLOGGER AWARD FROM ETSY COTTAGE STYLE BLOGSPOT. In order to be worthy of this award you must list 7 things that you enjoy or love. I enjoy waking up in the middle of the night with a great idea for creating something - then I can't wait to get up in the morning and make it. 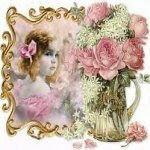 I enjoy meeting new friends on line and finding that the world is not as big a place as I once thought. We are all people, brought together by creativity and friendship. I enjoy being in my craft room creating, with my two fur babies curled up on the couch watching every move I make. Making the mistake of pulling out ribbon or the measuring tape - it means play time for them. I enjoy having my grand daughter over and her helping me combine fabrics to create something. She is actually getting quite good at what goes well together. I enjoy going into Vintage chat on Etsy and meeting up with my friends every evening. I enjoy being a member of the Raspberry Rose Sellers Club and the friendships that has brought me. I enjoy going to church on Sunday visiting God's house - makes the perfect start for me to begin my new week. 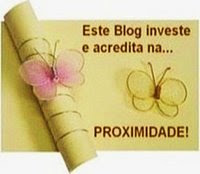 The other part of winning this blog is to award 7 other blogsites with this award. Be sure and visit them and leave a comment on their page. 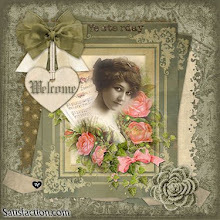 We all love company and who knows, you may even decide to follow one of these blogs. You can also enjoy their creativity. 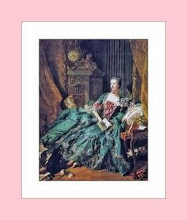 VICTORIAN ORGANZA PILLOW - NOT JUST ANOTHER PILLOW. I have always loved organza. In fact when my daughter was graduating I sewed her dress and made it out of organza. The organza was ivory in color and had a scalloped edge and embroidered pattern that went up from the bottom. I made her an underslip in jade green satin, with the overlay of ivory organza. I didn't have a pattern so I made it out of an old bed sheet first, then when I was happy with how it looked, I used the good fabric. The neck had a scalloped edge, the end of the sleeves had scalloped edge and of course the bottom of the skirt. Not an easy task to get all of the scallops where I wanted them. 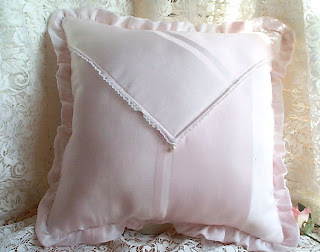 The other day I pulled out this beautiful organza and decided to make a pillow. This organza is white with beautiful embroidered flowers and I lined it in a soft pink to bring out the embroidery. Even the ruffle is lined. 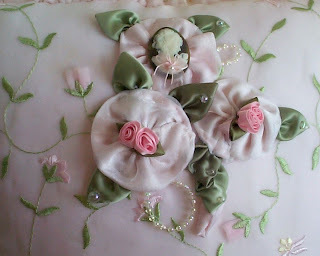 I then used some of the ruffles to make circles in which to show case the cameo and tiny rosettes. I am really happy with how this turned out. The back is fashioned from a vintage table cloth. I have this pillow for sale in my Etsy shop. If interested, just click on thesandis Etsy stuff logo on the right hand side and it will take you there. 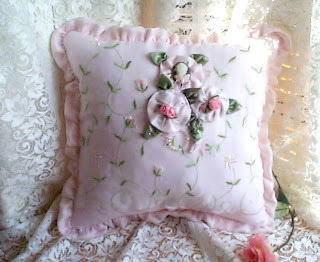 Or click on http://sandistuff.etsy.com This pillow was a real labor of love as it took a lot of time to create. Hope you like it.